6 entries from 5 different schools were received. Entries were submitted to SENRUG by the last day of the summer term (July 14); and judging took place over the summer. The judges were Ian Arkle, Editor of The News Post Leader, and Pete Myers, Stakeholder Relationship Manager at Northern Rail, supported by Dennis Fancett, Chair of SENRUG. The cash prices of £250 to the winning school and £50 to the two runners-up was sponsored by The Arch Group – The Northumberland Development Company. The prize also included a trip to London for students from the winning team to present their DVD to their MP at Parliament, and to visit Northern Rail’s Operations Centre at York Station on the return journey. This part of the prize was sponsored by East Coast Trains, CrossCountry and Northern Rail. Wansbeck MP Ian Lavery and Blyth Valley MP Ronnie Campbell (who both strongly support the re-opening campaign) promised their full co-operation in the event a school from their constituency was declared the winner. The BBC and News Post Leader TV both gave permission for schools to copy up to 90 seconds of material from their archived news reports to include in their entries. SENRUG wishes to thank all the above mentioned organisations for their support, as well as all the students and staff involved from the participating schools. The results of the competition were announced at a packed special SENRUG Public Meeting on Friday 12th September 2014 at Morpeth Town Hall, at which all 6 entries were shown. The meeting also included a brief update from Northumberland County Council on the progress of the re-opening. 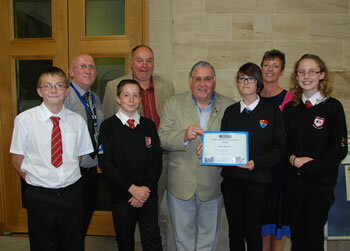 Prizes were presented by Cllr Dave Ledger, Chair of The Arch Group and Deputy Leader of Northumberland County Council. The standard of all the schools’ entries was particularly high and SENRUG believes their work has made a significant contribution to our campaign to see the Ashington Blyth and Tyne Railway Line re-opened. SENRUG both thanks and congratulates all the students who participated as well as the teachers and sponsors who have all made this competition possible. 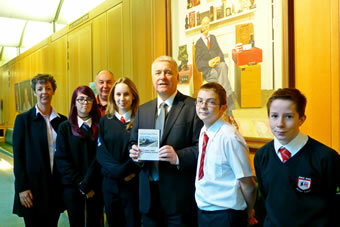 The winning team from Hirst Park Middle School travelled to London to present their DVD to Wansbeck Ian Lavery MP on Tuesday 16th December, just over 50 years from the withdrawal of passenger services in November 1964. The team also toured parliament in the morning and visited Northern Rail’s Operations Centre at York on the return journey. 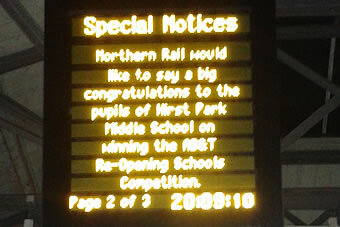 Northern Rail displayed a special message on the CIS screens at Morpeth Station for the day, congratulating Hirst Park Middle School on their success. SENRUG subsequently received a Special Award from RailFuture, the national rail campaign organisation, for organising the competition.